In this post we are going to take a look at some of the top 10 best rappers in Nigeria currently. 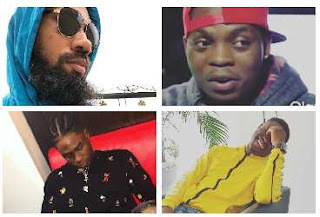 These rappers are rated as the best rappers in Nigeria,for some years now,the Nigerian entertainment industry has improved greatly,Nigerian rappers and artists are now getting recognized worldwide. Here are some of the best rappers in Nigeria currently. Phyno whose real name is Azubuike Chibuzo Nelson is one of the most influential rappers in Nigeria. He is an indigenous rapper from the south east. Phyno raps mostly in Ibo language and occasionally adds pidgin and English to his rap flows. He kicked off his musical career in 2003,his first album was titled ''no guts no glory''. Currently he is one of the hottest and best rappers in Nigeria,he also organize tours in Europe and in America. He currently holds the record as the only artist in Nigeria to completely fill up a stadium during his concert titled 'Phyno Fest' in Enugu,he is also good friends with fellow indigenous rapper Olamide. Coming in at the 2nd spot is the CEO of YBNL records Olamide. There is no way that you can mention anything abut rap music in Nigeria without mentioning his name. Olamide whose real name is Olamide Adadeji is known for rapping in Yoruba which is his native language. For some reason some of the best rappers in Nigeria are indigenous rappers. Olamide is also rated as one of the most consistent rappers in Nigeria as he has been releasing an album almost every year since he entered the rap game. In 2015 Olamide released a collabo album with friend and fellow indigenous rapper Phyno,the album was titled ''2Kings”. M.I whoe real name is Jude Abaga is a hip hop recording artist, songwriter and record producer. He busted into the rap scene when it seemed as if rap was about to fade in Nigeria,he is one of the rappers that motivated a lot of other young aspiring rappers. Mr Incredible began his music career in 2003,currently he is the president of chocolate city,he is rated as one of the bet rappers in Nigeria. Falz the Bahdguy is a young rapper that started his career some years ago,currently he is one of the best rappers in Nigeria,the video of his song 'This is Nigeria' went viral within 24 hours after it was released. The rapper who is a lawyer,is also a talented award winning actor. Panshak Zamani is one of the rappers we won't forget in a hurry,he is popularly known as Ice prince. and friend M.I. The rapper raps fluently in English and also in Hausa language. Although he hasn't really been thrilling his fans lately with hit songs,that still doesn't change the fact that he is still one of the best rappers in Nigeria. Reminisce is one of he rappers that has been in the game for a very long time. His real name is Remilekun Abdulkalid Safaru. He has been pushing his rap game since 2008,he started performing when he was still in secondary school. The indigenous rapper has also released a couple of albums,and has featured in some hit tracks with fellow indigenous rappers Olamide and Phyno. Illbliss 'Ibo Boi' is one of the best Nigerian rappers,he is a hip hop recording artist and a stage performer. Mr Bliss is the owner of a talent managing company known as The Goretti Company,he has been credited for being the one that helped to launch the careers of rapper Phyno and sensational singer Chidinma. He has released a couple of albums and has also won some awards,Illbliss raps mostly in his native dialect which is Ibo. Vector whose real name is Olanrewaju Ogunmefun is one of the best rappers in Nigeria. He is also among the best lyricist in Nigeria. The Ogun state born artist is also a song writer. Vector has been in the rap game for a long time,he started his musical career in 2008,currently he is signed to GRAP. Ycee is one of the young gifted rappers in Nigeria,the rapper whose real name is Olumide Martin Alejo was born in 1993 in Lagos Nigeria. His hit song was ''Condo'' featuring Patoranking. He started his musical career in 2012 and has worked wih a couple of other top rappers such as Olamide,Falz Etc. Ycee is definitely one of the best rappers in Nigeria,he is the 9th best rapper in Nigeria. Lil Kesh had millions of Nigerians dancing the viral Shoki dance. Lil Kesh's real name is Keshinro Ololade,he was born in Lagos state. He is also a songwriter,after the release of his hit song Shoki he went ahead and released some other tracks such as "Is It Because I Love You" "Gbese" etc,he also released an album titled ''Y.A.G.I'' which means young and getting it. He is one of the best young rappers in Nigeria today.